You will find us here: Hall A2 | Booth E118 World Fair for Mold- and Patternmaking, Tooling, Design, Additive Manufacturing and Product Development. 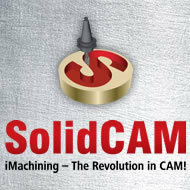 ..SolidCAM user can remove 7.7KG of material that they have never cut before in 17 minutes!...simply amazing! ...excellent iMachining benchmark – saving 72% in cycle time, cutting deep in stainless steel with ISCAR tools..
...saving 72% in cycle time, cutting deep in stainless steel.. The programmer could not believe that even though they have to fix the part with vacuum fixation, the part can be cut at such high speed.